I fell in love with Leeuwarden a little too much and so we had another little wander in the morning before leaving. The streets are all so pretty and smooth, I love it here. I ended up buying myself a pair of felt clog slippers with the Friesland pattern on, and I absolutely love them. 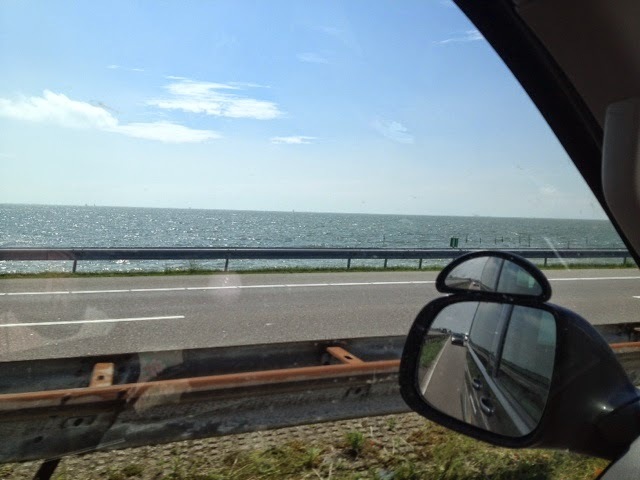 We passed a few windmills on our journey to Amsterdam and lots of Friesian cows (funny that) before we got to the Afsluitdijk, which is a long road which connects Friesland to the western part of the Netherlands. 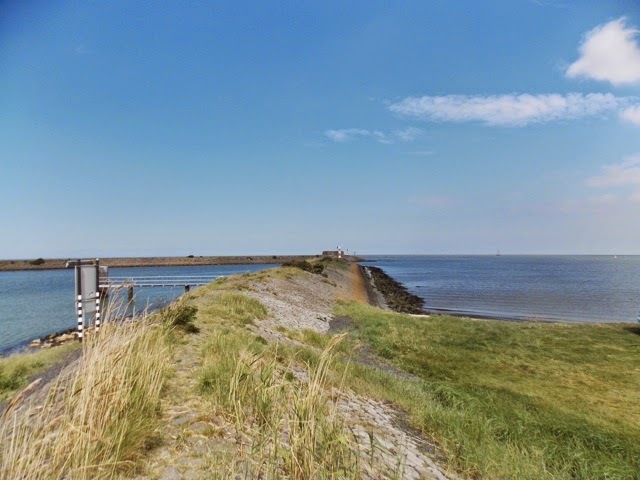 It's pretty cool as it was built up from the seabed and so it feels like you're driving into the sea, it really is just a road with sea either side! 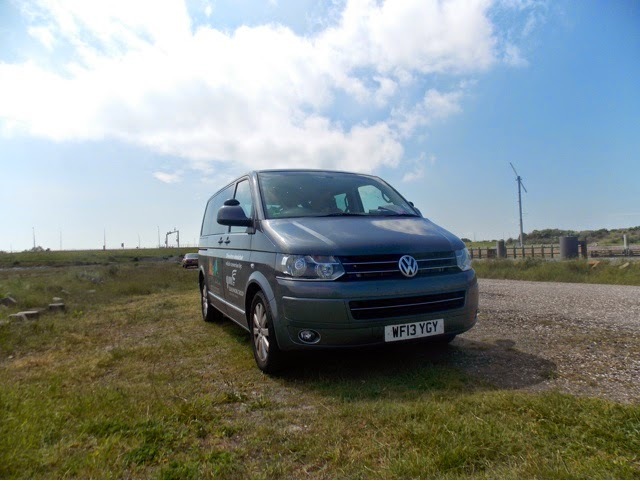 We stopped half way at a layby to snap some photos. I can't deny that I'm starting to feel quite tired now. It'll be nice that we have a few days in Amsterdam so that we don't have to rush and pack up in the morning. 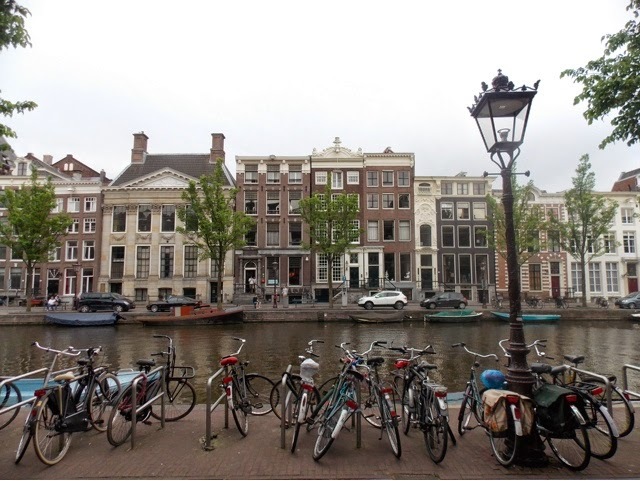 But Amsterdam felt like the most difficult city to drive through as we weren't sure who has priority with the bike lanes, pedestrian lanes and the tram lanes! When we had to wait for a lorry to finish loading, cars were beeping us and shouting to mount the curb, which of course we can't with a lowered van and my back to consider. Many streets headed in one direction and the side streets were really narrow- unfortunately the Q-park parking under ground was 1.9 and we couldn't get our van in so it's now outside the city in a safe parking lot, but a 30 minute tram ride away. Our hotel is bang in the center of Amsterdam: The Convent Hotel. This was a Christmas gift from my parents and what a luxury it is! 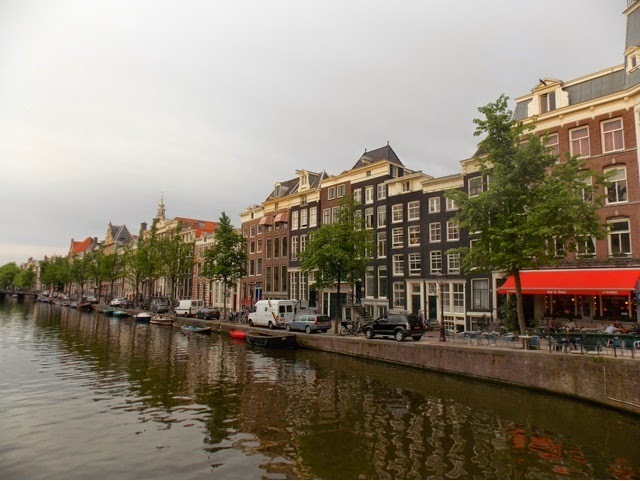 We are just around the corner from Centraal Station and Dam Square which has the Royal Palace and Madame Toussards wax museum, and leads off to the main shopping streets and to the Red Light district. 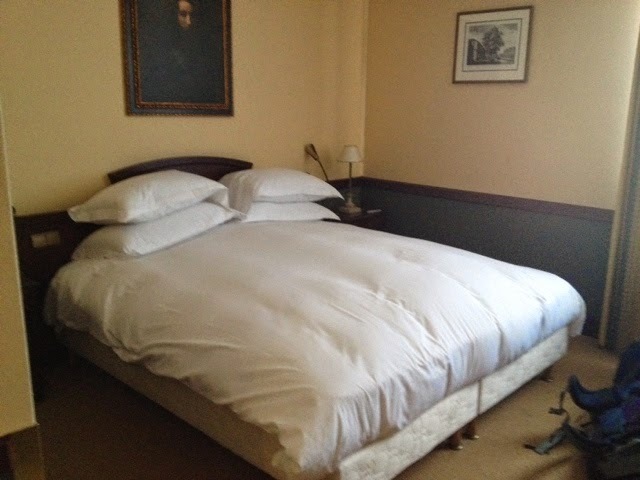 But our hotel room is great with lots of room at the foot of the bed once we had moved some furniture. There's enough room at the side of the bed to use the hoist too, which goes under the bed as it's nice and high and on legs! 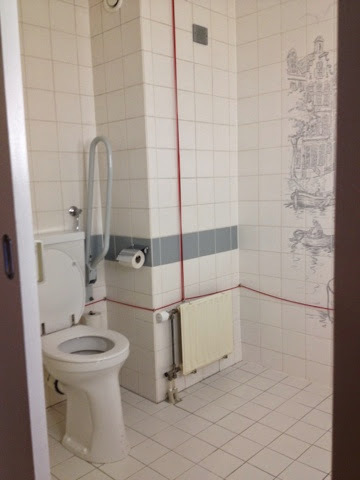 The bathroom is very spacious with a wet room shower, and also has the emergency pull cord around the edge of the room as I mentioned in my previous post- great job Holland, I think this is awesome. It was absolutely boiling as we wandered around the streets of Amsterdam, it was only a Thursday but it was completely full of life and activity- we walked passed all of the "cafés" and rarely saw one actually selling coffee. I was pretty tired and really hungry, so after a quite a while exploring we headed to China town to grab something quickly before David and I went off for our canal ride in the evening. We had a lovely Thai meal and I can never order chicken and cashew again as that was the best I've ever had, it won't be the same at home! 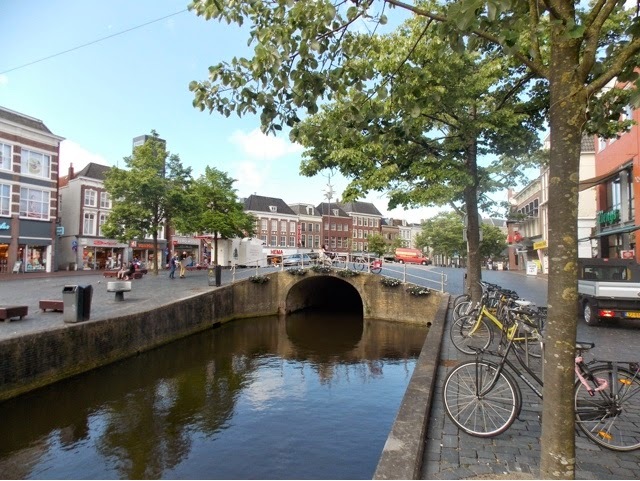 Our canal cruise was with the Blue Boat company who has assured me that I could access their boats from my electric wheelchair, so I had booked an 8pm night cruise (which heads through the red light district only at night) to hopefully watch the sun set along the canals. It was a good 30 minute walk from Dam Square and when we found the port, the boat I had booked wasn't accessible. The clerk explained that the 9pm boat WAS accessible but I felt concerned walking back through the outskirts of the city at 11pm, I was already so exhausted. Thankfully we have been able to reschedule for tomorrow as all day boats are accessible. I should mention that all of the roads here are cobbled or small flag stones, so it's difficult to get anywhere quickly. And with that in mind, you have to cross roads and more importantly the cycle paths very quickly, so this combination doesn't work very well for electric wheelchairs. There are also lots of tram lines to cross which isn't so much of an issue but something to be wary of. Several cars have given way or stopped for me to take my time crossing but are always met with horns blaring, what's wrong with some people?